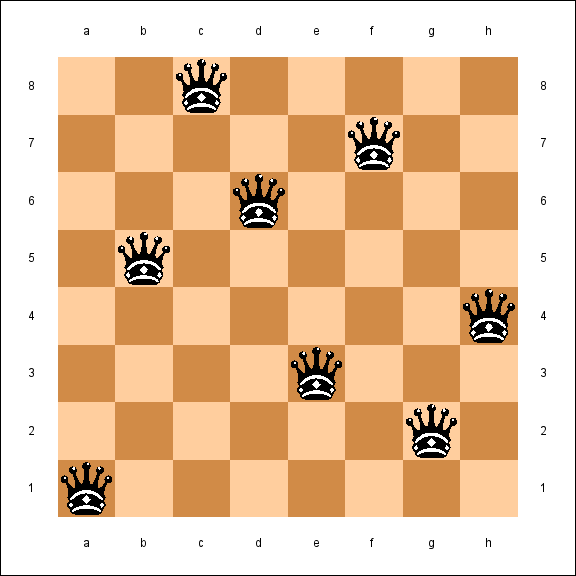 The Eight Queens problem is a special instance of the -Queens problem, where the objective is to position queens on an chessboard such that no two queens attack each other. The CLP procedure provides an expressive constraint for variable arrays that can be used for solving this problem very efficiently. You can model this problem by using a variable array of dimension , where is the row number of the queen in column . Since no two queens can be in the same row, it follows that all the ’s must be pairwise distinct. Hence, the ’s are pairwise distinct, and the ’s are pairwise distinct. These two conditions, including the one that the ’s be pairwise distinct, can be formulated using the FOREACH statement. The ARRAY statement is required when you are using a FOREACH statement, and it defines the array A in terms of the eight variables A1–A8. The domain of each of these variables is explicitly specified in the VAR statement to be the digits 1 through 8 since they represent the row number on an 8x8 board. FOREACH(A, DIFF, 0) represents the constraint that the ’s are different. FOREACH(A, DIFF, -1) represents the constraint that the ’s are different, and FOREACH(A, DIFF, 1) represents the constraint that the ’s are different. The VARSELECT= option specifies the variable selection strategy to be first-in-first-out, the order in which they are encountered by the CLP procedure. The corresponding solution to the Eight Queens problem is displayed in Figure 1.3.